Sunset Knoll (#9) is the morning line favorite as she drops in class out of a tougher $35,000 claimer at Saratoga. She actually put in quite an effort that day, running off on the lead while setting an extremely fast pace for the distance. She was claimed by the sharp Danny Gargan and lands in a good spot from a class perspective. However, she will have to deal with the speedy Saratoga Smoke (#5) on the front end, which could soften her up for one of the closers. I believe that late runner could be long shot HOLD ME DOWN (#1). She has faced tougher company in many of her turf starts and actually ran better than it appears when dropped in class last time. She was never able to cross over to the rail and ended up racing three- to four-wide around both turns. All things considered, she may have run one of the best races of all to be beaten just over two lengths. 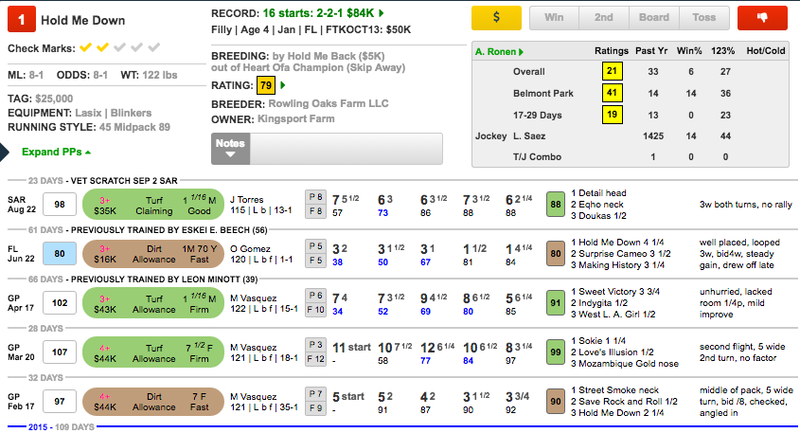 I love the rider switch to Luis Saez for low-profile but capable connections, and I believe she will offer value today. The others to include are Lady Bling (#4), who never really threatened to win last time but nevertheless ran well enough in a return to form, and Voila La Victoire (#8), who needs to improve slightly but has at least been more consistent through her last few starts. Droppers are never getting better & “Hold Me Down”should come around,but I’ll throw out the 9 & make mine 1 with,4,5,8,10. Make that Forever for Always instead of the 10. A lucky $77 for all believers.